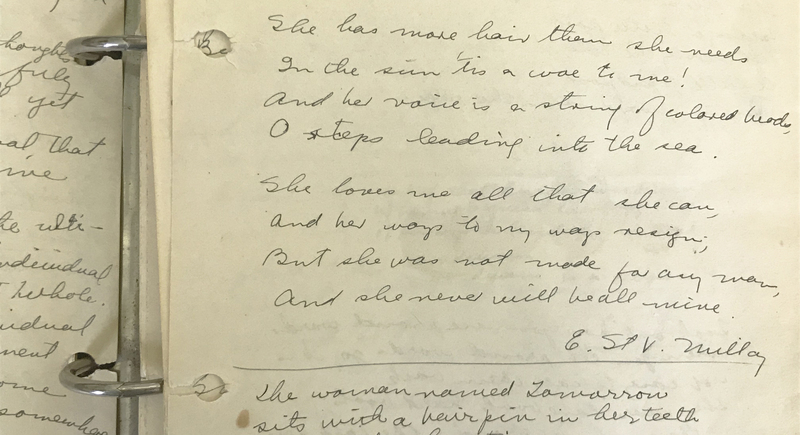 Special Collections and University Archives is pleased to announce a new finding aid published for the Bernice Leland papers (Ax 150). The finding aid is available on Archives West. Bernice Leland was born in 1882, traveled to many countries and later studied learning and reading disorders at the Psychological Clinic in Detroit, Michigan. She traveled to Tahiti (from September to November of 1909) and New Zealand (November 1909 through March of 1910) with Winifred B. Chase. They collected botanical specimens, especially algae, for Josephine E. Tilden of the Botanical Department, University of Minnesota. The Bernice Leland papers includes a diary of Ms. Leland’s trip searching for botanicals in Tahiti and New Zealand, as well as correspondence concerning the trip. 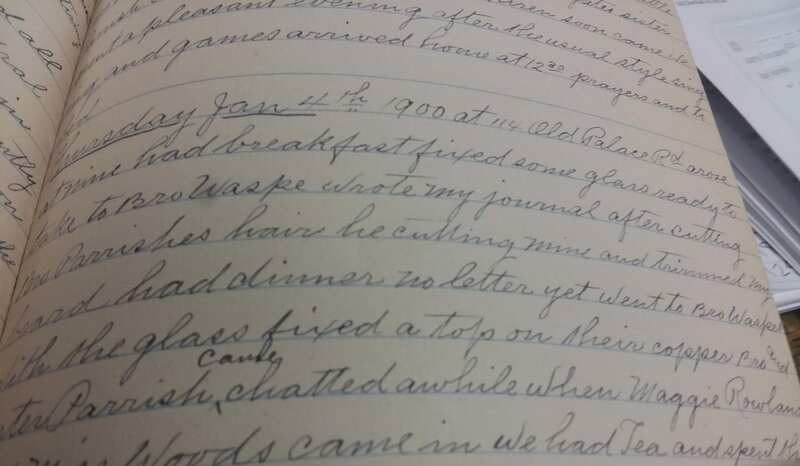 Also included are trip reports, news clippings from local newspapers about Ms. Leland’s trip, and speeches and research notes and articles written by Ms. Leland on learning and reading disorders. I absolutely loved the topic of Ms. Leland’s studies on reading disorders and plan to investigate her more closely in order to learn more about what she studied, especially her diagrams of the eye and the ideas she presented in various speeches. Some of the challenges included that a lot of the data had obscured or hard to read dates. It was nice when everything was bound together in a way that made sense, with the notebooks. Special Collections and University Archives is pleased to announce a new finding aid published for the Heber Hyder Davis papers (Ax 131). The finding aid is available on Archives West. Heber Hyder Davis, a member of the Mormon Church in Salt Lake City, Utah, was born there on November 16, 1854, and died November 29, 1942. He was a missionary to England from the years of 1899 to 1901. He was born to Edward William Davis and Sarah Elizabeth Hyder and was a church Elder in his later years. Special Collections and University Archives is pleased to announce a new finding aid published for the Jasper Cranfill diaries, 1865-1866 (Ax 128). The finding aid is available on Archives West. Jasper Cranfill was the son of Isom Cranfill and was born October 10, 1841 in Wilmington, Illinois. Jasper worked on his father’s farm in Linn County near Peoria, Oregon, went hunting, fishing, and helped his father with woodworking. He died May 5, 1867. 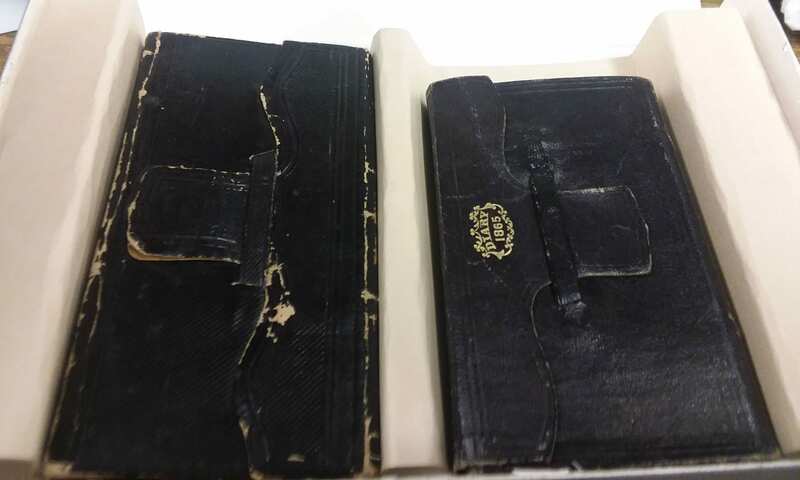 The Jasper Cranfill diaries are two slim, black, leather-bound volumes, dated 1865 and 1866. These journals are brief recordings of his daily life, weather, how many hours he worked for his father, how many animals he shot or caught, and more pertinent information from his farm life. Detail of Edna St. Vincent Millay quote in commonplace book of children’s book author and illustrator Elizabeth Orton Jones. Elizabeth Orton Jones papers. Coll 200. Box 7. Special Collections and University Archives, University of Oregon Libraries, Eugene, Oregon. A new exhibit is now on view during the Winter 2018 term in the Paulson Reading Room in Special Collections and University Archives titled Creative Commonplacing: The Facets of Book Love. Students of Professor Mai-Lin Cheng’s Fall 2017 course HC421, “Book Love: Or, Reading Commonplaces,” curated this exhibit of commonplace books, diaries, and scrapbooks. The exhibit also highlights other “book love” projects undertaken by the students during the course, including the results of a bookbinding workshop with Collections Conservator Marilyn Mohr and a handwriting workshop with Manuscripts Librarian Linda Long. The public is invited to an opening reception in SCUA on 1/18/18, 4-5 p.m.
Our class during Fall 2017 was the first of hopefully many future classes on the topic of Book Love, exploring the origins of book writing and what it means to love books and share what we understand of the world. Commonplaces are both a reflection of an author and their greater community, with the practice beginning in the seventeenth century as a type of note-sharing. In this class, we explored what it means to be an author as opposed to a compiler, as the lines are often blurred in commonplace books, as readers created their own personal anthologies, with passages, images, and other artifacts important to them to create a commonplace book. The commonplace book is an artifact of active reading. In it, the reader becomes writer. The interchangeability of these two modes of relating to texts is, of course, familiar in our contemporary era of cutting-and-pasting, tweeting and retweeting, liking and linking. Exploring the origins of this information-sharing, however, reveals a more exclusive and exclusionary history in authorship and the sharing of information, and through exploring the history of book-making students deepened their awareness of an elitist history of information control. In this class, students experiment with individual methods of expressing “book love” in creating their own print or digital commonplace books, and through reading the same texts each student created their own unique commonplace work. 16mm Lost and Found Blog highlighting University of Oregon Special Collections and University Archives 16mm films. Oregon Digital Newspaper Program ODNP is an initiative to digitize historic Oregon newspaper content and make it freely available to the public through a keyword-searchable online database. Oregon Rare Books Initiative The Oregon Rare Books Initiative (ORBI) seeks to publicize the wonderful early print and manuscript collections of Special Collections and University Archives, University of Oregon. Warner and the World This blog investigates, inspires, and collaborates with research examining the life, work, and collected material of Gertrude Bass Warner.